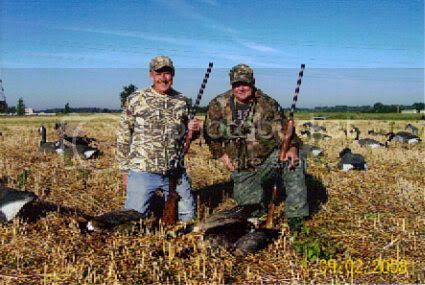 These two hardy goose hunters, Randy and Darryl, along with their brother Brett, and friends Jack Murari and Randy Redmond have had quite a goose season.� Darryl is the expert, and has various pieces of farm land to hunt.� He knows how to lay out decoys and is an expert goose caller.� All the guys have individual one person ground blinds that help conceal them till the last minute. 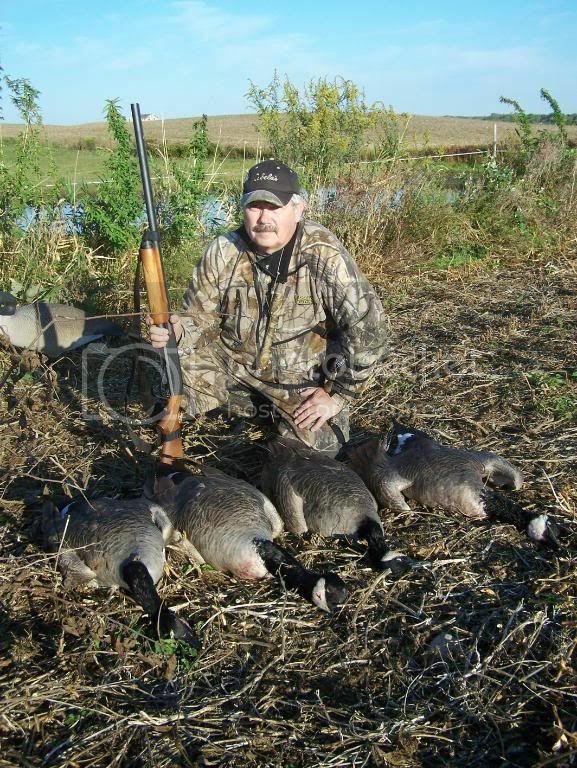 One of Darryl’s hot spots is just a 1/4 mile inland from Lake Erie, and the other is about 2 miles further inland.� I think they all have enough goose breast in their freezers to last the winter.� Recently I’ve been called to participate, but usually have something else going on (like watching grandkids! 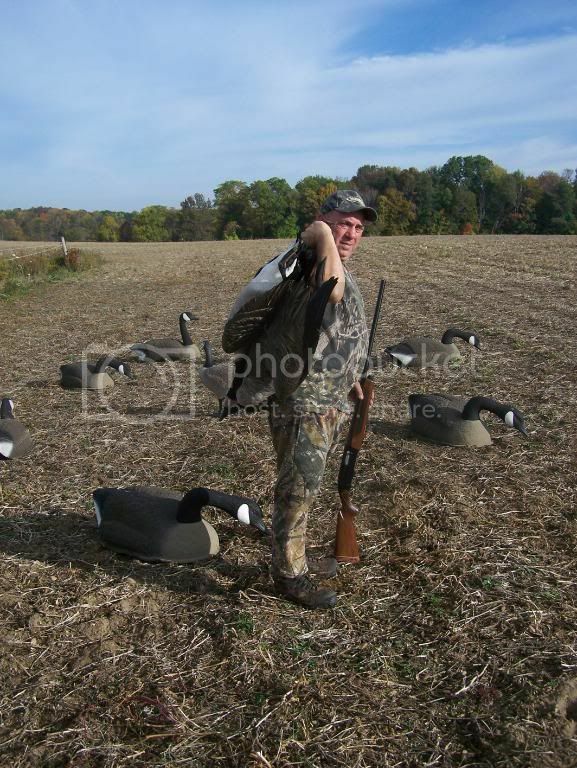 )� The last few times the guys have went out there’s been frost on the pumpkin, and a very brisk chill in the air.� To cold for this fair weather goose hunter.� These guys are dedicated to the sport and don’t let a little sub-freezing temperatures get in their way.� It’s not always a goose in every pouch, as the last two times they’ve ventured out they have come home empty handed.� Oh well it’s in the camaraderie of the hunt and not necessarily the taking of the game. Not very long ago I wrote a post concerning the way, the present economy, has effected hunting on a personal level.� Well the chickens have come home to roost around my house.� I haven’t been over at my lease property for 2-1/2 weeks, as it cost me between $150 and $200 dollars every time I go.� The finances just aren’t there, which has forced me to take some drastic measures! In order to come up with some “cash reserves” I put several items up for sale in our local newspaper.� Two shot guns, that I never used, went on the auction block, as well as a huge Colorado mule deer and a trophy whitetail.� I also put my 2000 ranger supercab 4X4 in the want ads.� The shotguns were a Mossburg pump, ventilated rib, gold trigger addition, in super condition, and an almost new Remington 20 gauge Express magnum.� I sold them way to cheap!� First guy that came over took them both, and I had 35 calls after that.� I’m embarrassed to mention what I sold them for! 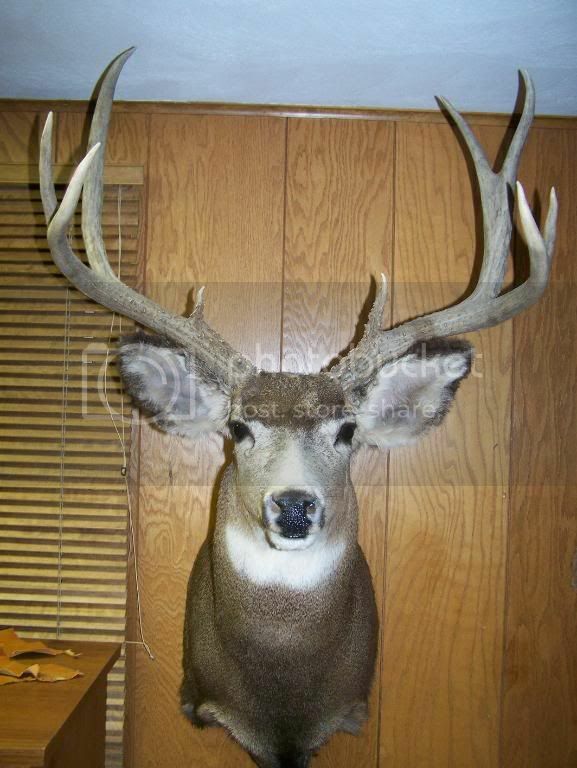 The mule deer was one I found on my Colorado elk hunt, so the attachment to this mount was minimal.� It is a very nice rack and probably scores around 150-160.� The huge 12 point, heavy mass, split G-2’s, whitetail was given to me by a friend, so it is void of any hunting memories.� The first guy that looked at these took them both home for $700 dollars!� The “kitty’s” growing! Actually my truck went the same day, and I will miss it more than the other things, especially since riding my motorcycle is freezing my “buns” off.� I can’t go very long without a truck, so am looking for a 2-wheel drive 4-cylinder that gets 25 miles per gallon.� Yesterday my mother loaned me her Dodge Neon, which gets me off that bike. My walls have a few empty spaces, my gun cabinet less guns, and my driveway is minus a truck, but a mans got to do what a mans got to do in order to pursue the “call of the wild!”� My hunting fund is finally in the black, but now I have to see if I can find some “TIME” for sale. If you’ve seen very many of these optical messengers you’ll know that they can be formed by rain, mist, dew, spray, fog, and ice. I have enjoyed these meteorological phenomenon from the sub-arctic to the Barbados islands, from the Rockies to Hawaii, but their message to me is always the same. Genesis 9: 13-15 says “I have set my bow in the clouds, and it shall be a sign of the covenant between me and the earth. When I bring clouds over the earth and the bow is seen in the clouds, I will remember my covenant that is between me and you and every living creature of all flesh; and the waters shall never again become a flood to destroy all flesh.” It is a promise an everlasting covenant that cannot be broken, but it also reminds us that God does not “wink” at our ways! In the old days I could of said “wink at our sins!” but that is not politically correct anymore, so I won’t say it. I don’t know about you but when I was a kid I used to think “if only I could find the ‘pot of gold’ at the end of the rainbow, my dad wouldn’t have to work so hard!” We’d be rich and mom could have all those things she deserved. 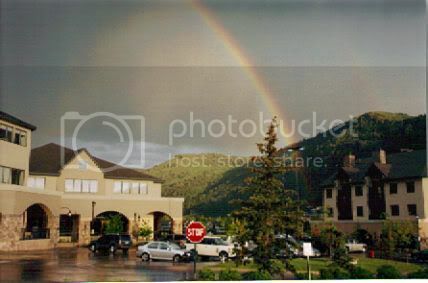 Me and a couple of my buddies even tried to walk to where we thought the rainbow was touching that pot of gold. We never seemed to get any closer, and after a few blocks we gave up our dream. The reason (I found out when I got older) that you can never reach the end of a rainbow is because when you move toward it, it moves further away from you! A rainbow is an optical effect which occurs due to the position of the viewer. I don’t know what’s going on with this particular post, but I’ve tried three times to publish it to no avail. So we will try again and hope for better results. This is some of our gang at our annual fall donut making event. We have done this for many years, and it’s become a family tradition to have donuts and cider during the month of October. This year I bought a new propane deep fat fryer that will do nine donuts at a time. The old fryer would only do three, so this process was made much faster by the new equipment. One recipe will make 60 donut’s, plus donut holes for the kids. We let them put their own toppings on, and they have a choice of powdered sugar, frosting, and sugar and cinnamon. We also let them add some “sprinkles” if they want. It took about two hours to prepare everything and another hour to clean up, but it only took 20 minutes to get rid of 60 donuts. You can’t plan on having a donut and coffee, in the morning, with this crew. You can’t really blame us though, as these home made pastries are deliciously light and fluffy. Usually we have a bon-fire to go along with the festivities, but we raked leaves into a big pile this year, and let the kids slide into them from the play set in the backyard. They had a blast playing in the leaves, and I was able to burn part of the half million leaves in my yard the next day. We are planning to include a kids hay ride next time we do it, which could be soon, if the weather holds out. 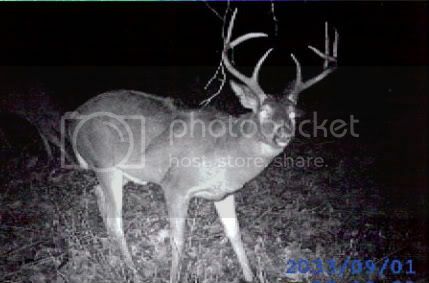 In my last blog I wondered if any readers saw something out of order with the nice “trail cam” buck? Art over at “Simplyoutdoors.net” was the only one to respond so far, and he has been suffering from sleep deprivation since his new daughter came into his life. Art was too “groggy” to even take a guess, so here’s what I think. If you notice the deer looks like a “sway-back” horse, and has a mane to boot. Down along the backside of the stomach area there appears to be a bulge, or a tuff of hair sticking up in an unnatural position. Could this be some kind of a wound? If it is, that could be the reason, this deer has some unusual characteristics. It is not all that uncommon to find “big game animals” (especially deer) with healed over wounds. We have taken several deer with broadhead or gunshot wounds that have been completely healed. Deer are especially tough, and that is why a double lung or heart shot is what any conscientious hunter should be going for! To take a shot at any legal game animal, that does not guarantee a quick and clean kill, is not good for you, our sport, or the game we pursue. I know there are “no” guarantees when it comes to shot placement, but you get my drift when it comes to that all important ethical shot! Trail cams are becoming more and more popular these days, and here is one of the reasons why. If you are trying to figure out what’s traveling where, or who made the big scrape in the fence row, trail cams can be a real time saver. Not only that they are a big snitch! Many a big buck gets caught on film that “no one” has ever seen in the area. Chances are you won’t see him during daylight hours, but then there’s always the rut! Bucks of all sizes get “crazy” during mating season, including the big boy’s you never see during shooting hours. 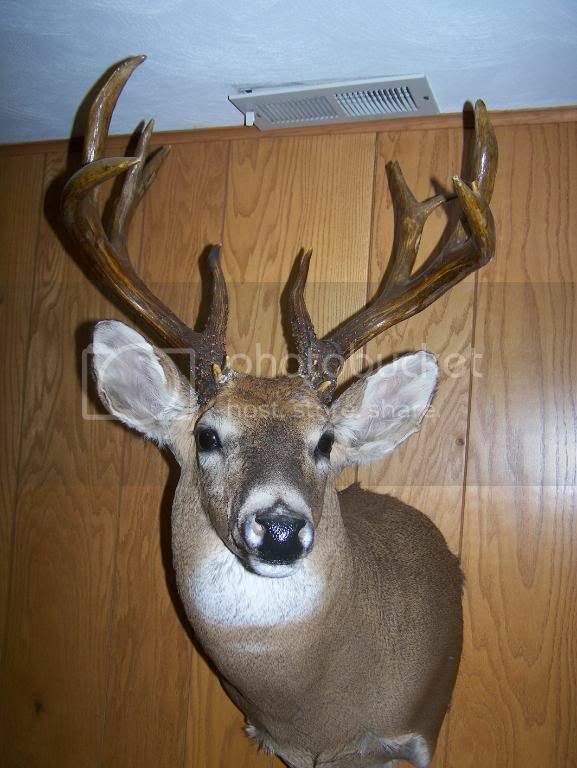 Just to know you have a great buck like this in your area gets the adrenalin flowing. As you can see the date is not correct on this picture. It was snapped last year in the Hocking Hills area of Ohio. There is something very unusual about this buck! Notice the heavy “mane” along the back, and there is something else that just doesn’t seem right. See what all you deer experts can come up with. If anyone has some good trail-cam photo’s they want to share send them to my e-mail (mikewansel@yahoo.com) and if I get several I’ll do an article on them. 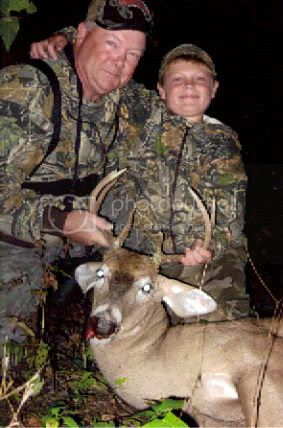 Haven’t really heard about very many of the hunters I know getting deer.� This is a picture of my little brother Darryl with his grandson Tristen, and his fat little 8-pointer.� Darryl dropped him last week, and had Tristen in the stand with him.� Darryl has several of his grandkids go out with him, and there’s not a better way to get the “young ones” involved in hunting.� His grandkids are “hooked” and a couple of the girls are wanting to tag along also.� I never have to worry about getting a story from Darryl.� He’s the consummate bowhunter! I stopped over to his house this evening, and of course he was out hunting.� He arrived home before I pulled out of the driveway and showed me his beautiful little garage sale “take-down recurve!”� I pulled it back a few times, and there was no stacking at all.� Very smooth, and very pretty, and it only cost $20.00 dollars.� Now that’s a steal!� Darryl can shoot another buck, but it has to have a least 4-points on one side.� From the looks of the activity in his area that shouldn’t be a problem.� I wonder which grandkid he’ll have with him when he “hammers” his next corn feed buck?� If your grandkids are busy Darryl I’ll go with you old buddy, old pal, favorite brother of mine! This past weekend I experienced a very unusual aspect of wildlife genetics.� The fence row that my tree stand is in was being thinned out by the land owner this past week, so I was able to hunt another area that is normally closed to hunting. During my two evenings, on this unfamiliar property, I hunted from a pop-up ground blind.� I had alot of activity going on around me, and did a blog for “Base Camp Legends” concerning my encounters with a variety of fur and feathers.� What I didn’t mention was the very special turkey I saw both evenings. About an hour before dark a huge flock of turkeys began filing into their roosting location.� I put my binoculars on them, as I have a permit for this area.� I’ve taken two turkey’s with my bow, but it is not an easy accomplishment to pull off.� These birds were too far away, but I was mesmerized by the sheer number of birds.� Several old gobblers were among the group I was glassing; then something grabbed my attention, and kept me almost spellbound.� It was a totally “blond” hen!� She stood out like a neon sign among the much darker birds, and I could easily follow her with my naked eye.� She was good sized for a hen, which are legal game during the fall turkey hunt.� I’ve only shot one hen in my turkey hunting career, but might be tempted at giving this “blond bombshell” a second look.� I’ll be going back over to this area next week, and can’t let my wife know about the “blond” I’m hoping to see again. Friday, upon arrival, we made a blind along the fence row, and planned on setting the decoys to the east of us in the soybean field. As I said we did great, but if I could of changed anything it would of been the decoy position. Me being a rookie (that’s my excuse) I didn’t realize that looking into the rising sun could effect you seeing the geese flying from that direction! DUH!! It’s a good thing they were flying from all directions. The first goose ,of my life, was one coming from behind, that I called right to our position. I almost didn’t have time to drop the goose call, then drop the goose! I was able to call several flocks of geese to our position, and felt good that I didn’t scare them away. Tony and I kept pace with one another, basically taking turns on the geese “committed” to landing among the decoys. As I said we did great, and it was certainly a learning experience, but we “missed” on plenty of opportunities. It may take awhile to get this type of wing shooting down to be respectable! It is not as easy as it looks, and geese are as tough as anything with feathers can be. I think I’m hooked! I have the truck loaded with goose decoys and all my deer hunting “stuff.”� You wouldn’t think that the back of my pick up would be overflowing, but it is.� Even as I get ready to leave I can think of things I absolutely need!� I never have enough time or money when it comes to my little excursions. Tony and I plan on goose hunting opening morning (Sat. the 10th.) and then deer hunting in the evening.� We will be setting up our goose blind today and make some last minute adjustments to our deer stands.� I used a decoy last week, and it seemed to alert the deer more than attract them.� I’m leaving it at home until it gets closer to the rut.� The bucks are still running together, but over all the deer seem “spookie!”� I think the early seasons may have “tipped” them off.� I liked it better when us bow hunters were the first in the woods, but I’m a little selfish when it comes to that.� Will give an update report in a few days.